Hi guys, I am Shrine, a lv75 duelist in CBT. I am from Clan Order, and if you are interested, kindly go tinyurl.com/clanorder to view Clan Order’s forum thread (it’s in guild banter). The duelist isn’t OP. It ain’t weak. It’s not a tank, it’s not an assassin, it’s not a mage and it’s not a healer. A duelist is a mixture of a few classes. It can have the intellect of a mage and yet the tankability of a champ. Vit: The duelist has sufficient survivability. It does not need more. If you are more into PVP, get a bit of VIT for that additional HP (17 hp per VIT point) as the duelist’s HP is not fantastic. The duelist’s primary stat gain is INT and secondary is DEX, thus default VIT gain is pretty low. Spr: You don’t need that much mana and mana regen. For spells, you have pots for that. Str: You do not need physical damage. You dish out magical damage! Int: Put ALL your points into this. It increases not just the necessary damage you need, but also the crit chance. It does not however increase crit damage. DEX does that. Dex: You don’t need more evasion and accuracy. They are already quite high as DEX is your secondary attribute. DEX however improves your crit damage and not really crit chance. However, if you want to increase your comp. power (no practical use though), add DEX or simply re-roll a ranger/slayer. Evasion and Accuracy gains add the most to a player’s comp. power. All the MP, CD and Range stated are those of level 1 skills. This is your bread-and-butter skill. And as we know skills are extremely costly (both exp and coins-wise), this is the worthiest skill to max first. The 2sec cd will give you the needed damage output. It is all right to level this skill a few times, but stop levelling it once it gets too expensive. The magic atk increase is in fixed amounts (15 matk per skill level) and might not be that worth it to max. It is mana intensive but is REALLY useful at low levels. However, it does not scale that well with player level and equipment, as the additional amount of magic atk stolen per magic atk that the player has is not as significant. A stealing does represent a de-buff of the character or monster you stole from, and the effect lasts even after that character or monster has died. You cannot steal from Boss monsters, but can steal from Lord monsters. It is worthy and not that expensive to level this skill. I love this XP skill as we do not have to target it (unlike Ranger’s XP skill). It is exceptionally cheap to level this skill so level it whenever you can. XP skills deal minute damage to players. This is the main skill used to catch up with your opponent in PVP. Remember that it has a slow, so do not use your stun (Demonic Bind) immediately after you use this skill. Leveling the skill will improve only its damage, and also increases the MP required, so do level it only if you have spare coins. Your first AOE debuff! This aura will increase both your tankability and damage and will make killing an entire group of monsters a breeze. The only problem is that you have to keep the enemy within the aura to keep him or her or it debuffed. It is higher in my priority list than Demonic Fist, but below that of execute, XP skill and AOE damage spells. A really useful skill for PVP. It gives you substantial amounts of mdef and magic resistance. I love to max this after I have maxed my XP skill, Execute and AOE damage skills. This is THE SKILL TO LURE AGGRO. It is fantastic, sometimes even better than the ranger at luring aggro and *ahem* stealing bosses. The 10sec cooldown will *most of the time* ensure the boss gets locked onto you. Just be careful to use it during PVP in a dungeon, as it will lure the aggro of all mobs and grant you a swift death. Once again, this skill, together with the other auras, increases both your magic atk and tankability. Upgrade in tandem with other aura. Your first AOE dmg skill. Finally! It is a pity your AOE debuffs can hit 9 targets or more, yet this skill can only hit 5 targets. Nevertheless, max this after execute and XP skill. The 7sec cooldown makes this your second most spammable damage skill, and you need it to clear the mobs you have debuffed! This is a non-target spell, so it only attacks enemies in a 7m radius. Can be utilised during PVP to reach irritating pesky enemies (i.e. Ranger) when your execute can’t. This skill is awesome. It forces a monster to attack you (much like soul drain) and is mainly used when fighting bosses amidst a swarm of monsters, to not lure aggro from the swarm (like soul drain would). The main benefit is the healing reduction, which I believe is the reduction in both natural HP regen and healing spell (just like how gems increase healing effect for hrtcs and enc, this skill decreases them). I am not sure if demonic seed works on HP pots and food, any insights? Anyway, level this skill last because it is outrageously costly and only increases the healing reduction by a minute %. This will come in handy when killing monsters. It increases your damage to them by SUCH A HUGE AMOUNT. As the physical and magical debuff/buff and magical atk buff is %-based, it scales nicely with high levels. It is wise to max this when your duelist is at a higher level, and save your EXP and coins for other skills, such as the other AOE debuff, Weak Aura. Leveling the skill will increase the stun duration by a minute amount, and might be worthy to level if you are always pvping. The stun works at a great range of 12m, but it does not move you to the target to start decimating him/her/it. From my observation, the stun hardly works on Boss monsters, and have a decreased duration on Lord monsters. I LOVE THIS SKILL although it eats up my MP ravenously. It is the highest damage spell you have in your arsenal thus far and it hits 8 targets! However, because this skill is really expensive to level and its cooldown is longer thus giving it lower DPS, I will place its priority below that of Demonic Cleave. From here on, I have not tested the skills and will only give my opinion based on the skill descriptions. It is a great skill if you are playing the main role of a tanker. It is also great for survival during PVP when you are being ganked and are running away while waiting for a realm change. However, I am not too sure if this skill can be cancelled at any time once it is activated. If not, it will heavily affect your damage capability for well, 5 seconds (WHICH CAN BE A LOT). This long-ranged single-target skill is your highest damaging spell in your arsenal. A pity its cooldown is ridiculously long. Level this up for usefulness during PVP, you can run away from those melee DPS and utilise it whenever it is up without them touching you. This skill is fantastic for PVP despite the insanely long cooldown. At late game, a % of your magic atk will be huge damage! Let’s see. At level 1, this skill first stuns the target for 2seconds, then deals 15% of your magic attack and renders the target immobile for the next second. On the 6th second, it once again hits the target with 15% magic attack and renders the target immobile. On the 9th second, it comes again! In total: 45% magic attack, 3 seconds paralysis and 2 seconds stun. GREAT. Well you are not a duelist without being possessed by a demon. C’mon, we are princes and princesses who lent our souls to the demon to gain dark powers to safeguard Atlantis! For 10 seconds, you will have substantial increases in both tankability and damage. A must upgrade, duh? When using Combat Aid in an open field (non-dungeon), go to a high spawn area and set a low range (10-30) so you do not run away from that spawn. If you do not have platinum noble status, place Soul Drain, Shadow Cleave, Demonic Cleave and Execute in this order, with 0sec cast delay. If you do have platinum noble status, slot in Weak Aura and XP skill. When using Combat Aid in a dungeon with low spawn, set a long range (50-80). When fighting a boss, try to cast Demonic Seed, your debuff skills and then your damage skills. Do not waste your mana utilising the stun. Demonic Seed will keep the boss’ aggro on you. To *steal* aggro, use soul drain and run away to drag the boss away from the other party killing it. Do not bother using your aura spells when your enemy is ranged, as they will most likely get out of the aura to fight you. Do not use Demonic Bind and Demonic Fist together. You’re wasting the slow/stun. As your attack still has some range, consider kiting the opponent if he is melee. Stun an enemy when he or she or it has low health, so he or she or it will not be able to heal. These are just some of the tactics off the top of my head. There are countless other tactics that you guys can utilise to maximise the effectiveness of the Duelist. As the duelist is a melee INT DPS it is wise to get a pet that deals ranged physical damage so you attain a balance. The duelist’s damage is not entirely high though (not as high as berserker or ranger) and your pet, might lure away aggro, and if it does not have points in Dex/Vit, it might die. I suggest a Vit/Str or Dex/Str combination. Find a pet where adding Str adds damage, and is Dex or Vit base. And hope the pet is ranged. 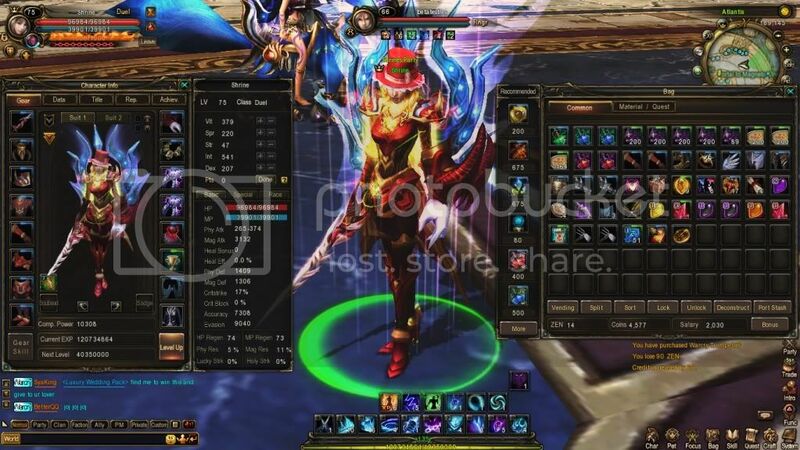 For skills, as the duelist often utilises AOE debuffs and taunts (soul drain lures 9 mobs to you, and Weak Aura debuffs multiple enemies) yet does not have massive AOE damage (Demonic Cleave hits 5 mobs while Shadow Cleave hits 8 mobs) it is strongly advised your pet have AOE skills. Nevertheless, AOE skills are ridiculously expensive and often only found on boss pets. I prefer fusion for VIT and INT. I will maximise my pet’s focus orbs to enhance Max HP, Pdef, Mdef, Mdmg, Crit%, Elemdmg and Elemdef. I do not place strong emphasis on the other stats. I will choose a VIT/INT pet for fusion. Or simply a VIT/VIT pet (Vit-base and Int/Str, but I just add Vit per level anyway). I place importance on maximising the focus orbs on evasion as well. VIT, INT and DEX are all important for fusion. Remember, pet skills and focus orb skills are not required for your fusion. Your character will not benefit from the skills. I will soon post some examples of good pets for the duelist. Let me do my research. Enjoy the Duelist. It can be so, so strong if played well (I am nowhere near playing it well). And do consider joining Clan Order (tinyurl.com/clanorder) if you are going over to the EU servers. We will most likely be in Gaia.